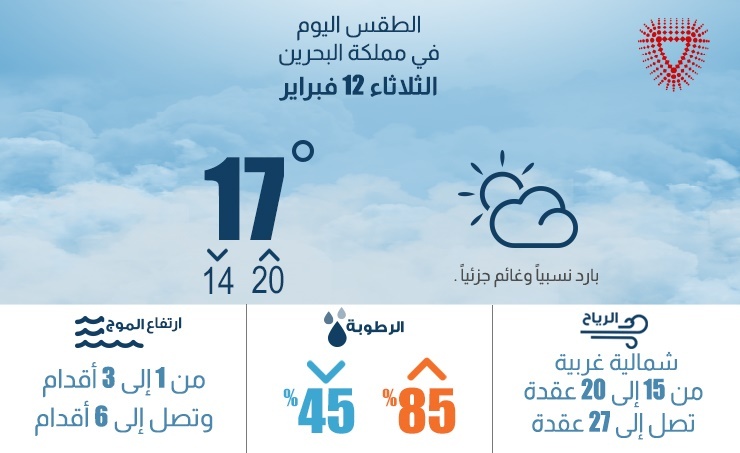 Manama, Feb. 12 (BNA): The Meteorological Directorate forecasts a cool and partly cloudy weather. Wind: Northwesterly 15 to 20 knots, reaching 22 to 27 knots at times. Temperature: Maximum 20 degrees Celsius and minimum 14 degrees Celsius. Sea waves: 1 to 3 feet inshore, 3 to 6 feet offshore.